Why a toilet runs periodically. Home / Lakewood Ranch Plumber / Why a toilet runs periodically. One of the most common complaints about toilets is that my toilet runs periodically or people hear the toilet turn on to refill the tank. They say that the noise occurs for about 5-10 seconds. When these people call a Sarasota plumber about this problem, their licensed master plumber in Sarasota will ask them about their toilet or as plumbers in Sarasota call them, water closets. The Sarasota plumber will ask them if they know the brand and age of their water closet. This is so the plumber in Sarasota can determine which flapper or flush valve they need to have on their plumbing truck, so if they are going to be Lakewood Ranch plumbers they want to have the correct parts on their plumbing trucks in Sarasota. The main cause for a water closet or toilet running periodically is normally caused by a flapper that is worn or deteriorated. The water in Sarasota has an amount of chemicals that is used to keep our water safe and potable. Over time this causes rubber parts such as flappers to deteriorate or warp. This causes the flapper not to sit on the flush valve flat. The flapper would then allow water to leak by between the flapper and the flush valve. Replacing the flapper will normally take care of a toilet that runs periodically. Take care to match your old flapper with the new flapper as there are quite a few flappers to choose from for all of the different toilets out there. A good plumber in Sarasota will carry a large variety of different flappers. A Sarasota plumber or a Lakewood Ranch plumber will carry a number of the same flappers on his plumbing truck in Sarasota, because if one toilet in the house is running periodically, chances are the other water closets are the same age, so the other flappers should be checked and or replaced at the same time by a Sarasota plumber. Make sure your plumber in Lakewood Ranch cleans off any residue that may be on the surface of the flush valve. If the flapper appears to be in good shape, the surface the flapper sits on could be warped. This piece is called the flush valve. a good plumber in Sarasota carries these on his truck. The toilet tank needs to be removed to replace the flush valve. There are many different flush valves to fit many different water closets. A Lakewood Ranch plumber or a plumber in Sarasota can help you identify which flush valve is the correct one for your toilet that runs periodically. When your toilet runs periodically, call Wimpy’s Dependable Plumbing, Inc.. 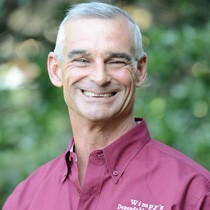 Serving Sarasota Florida as a family owned plumbing business since 1973. We only employ state licensed Master plumbers.